The ORIENT STAR V can accommodate large gatherings. In fact, we can carry up to 49 passengers. You name it- we can likely do it! 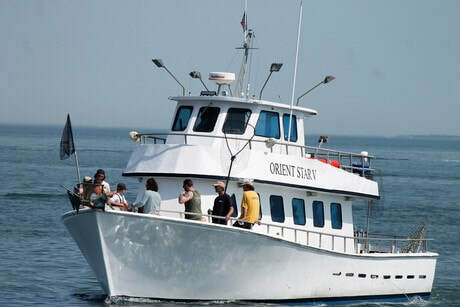 The ORIENT STAR V is the perfect venue for large Sportfishing groups or Lighthouse Cruise gatherings. The ORIENT STAR V can carry up to 49 passengers. The ORIENT STAR V completes annual United States Coast Guard Safety Inspections and we are proud members of the North Fork Captain's Association. We are licensed and insured. We invite you and your charter to sit back and relax the day away as you fish, while our Mate cleans, fillets and bags your catch of the day.